Tuesday, June 21 at 3.30pm Room G466, Gilbert Scott Conference Suite, University of Glasgow Reserve a free place via Eventbrite. Julie Stubbs is a criminologist and Professor in the Faculty of Law at the University of New South Wales, in Sydney, Australia. Much of her research focuses on women and criminal justice including women’s imprisonment, justice reinvestment, restorative justice, domestic violence law reforms, homicide, battered woman syndrome and sexual assault. 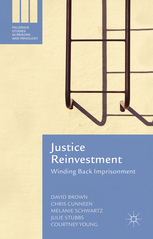 Her publications include two new books: Justice Reinvestment: Winding Back Imprisonment(Brown et al, 2016, Palgrave Macmillan) and Australian Violence (co-edited with Tomsen, forthcoming 2016, Federation Press). She is a member of the International Advisory Board of the British Journal of Criminology. Julie is visiting London and Glasgow as part of her current research on alternatives to women’s imprisonment.